Where are the Modest Men? My title is Dr Fern Riddell, not Ms or Miss Riddell. I have it because I am an expert, and my life and career consist of being that expert in as many different ways as possible. I worked hard to earn my authority, and I will not give it up to anyone. Surprise, surprise, someone took exception to this, claiming she was being ‘immodest’ by using the Dr in her Twitter handle. I don’t know if this (presumably) man had a PhD himself. Somehow I doubt it. Had she been known as Dr Fred Riddell would this have kicked off in the same way? Somehow I doubt that too. The image below is one person’s riposte which sums up the kind of attitudes being exhibited. It is such an easy put-down to deny women their proper title. I know many who feel one of the important perks of getting that hard-earned PhD awarded is the pleasure in not having to specify whether they are Ms, Miss, Mrs, Mx or anything else that most people should have no interest in. Yet society seems to need to pigeonhole us as one thing or another. This seems as true of the online world, with online forms and their pull-down lists: often there is no option of ‘Dr’, let alone Professor; and if Professor Sir is offered it is rarely paired with Professor Dame. I have been known to get grumpy about this last, though most of the time I’d happily go without any title whatsoever, as I do on my own Twitter handle (and no, I haven’t changed it this week). What some folk seem not to want to do is accord us women due (i.e. equal) respect with our male colleagues. Equal respect for equal qualification seems reasonable to me. Can you imagine a man being called immodest for wanting to draw attention to – or simply receive acknowledgement for – holding a PhD? A male authority, a male holder of a doctorate, seems to be far less threatening to the world at large. Read Mary Beard’s Women and Power if you are uncertain about this. Modesty remains too often a societal expectation for women in a way that it simply does not for men. Indeed, although many men do behave entirely modestly, those who do probably suffer in the same way as women in the face of others who are full of self-aggrandisement and arrogance. I can think of many similar words used that could be used to describe some men (but not many women) of my acquaintance, of which those are just a couple, but I probably wouldn’t dub them immodest. Their arrogance might indeed consist of something equivalent to meeting a woman and casually calling them Joanna and then turning to the no-better qualified male at the table and referring to them as Dr Smith. They might go on to point out anyhow that they were Professor Tom Bloggs just to make sure you appreciated their superiority. Give me a modest man any day for a dinner companion or a fellow committee member. Someone who doesn’t need to tell me they turned down offers of a Chair at Princeton or that they know Lord XYZ very well. One whose special knowledge or skill causes him to be regarded as an authority, a specialist. A man recently tweeted me to ask how he, as a man, could help to support the only woman in the room. My response was simple ‘Amplify what they say so that credit does not go elsewhere and make sure they aren’t constantly interrupted or talked over’. I think something similar should be done if you watch one of the arrogant tribe demeaning a woman by miscalling her, let alone mansplaining her work or trying to explain something he knows nothing about to someone who does. I’m reminded of Mary Beard being attacked about Roman Britain by the former options trader Nassim Taleb. I know who I’d trust to know more about the subject and it isn’t the man. As I’ve written about before, rarely do people try to mansplain to me across the dinner table although occasionally I have encountered those who assume they are more of an expert than a mere woman could be. For instance in that post I’ve just linked to, an art historian tried to lecture me – extremely inaccurately – about genetics. I may be no expert, maybe some art historians are well-informed on the subject on the side, but in this case I certainly had far more facts at my disposal than he did. Did he notice? He did not. Just blundered on, no doubt believing in his own self-worth. However, I am quite sure it behoves me to step in if I see someone else (statistically more likely to be male) do that, to amplify the comments of the colleague and try to stop the arrogant offender making himself more obnoxious and, quite probably but unbeknownst to him, looking stupid into the bargain. This will particularly be the case if the remarks are addressed to a junior colleague, who may feel diffident, and regardless of whether they are male or female (although probably more likely to be the latter). It is my responsibility to stop others being overbearing, in committee meetings or across the dinner table or even a railway carriage. As a senior professor this is part of the ‘calling out’ I am determined to be more active about. I reiterate the points I made previously: amplify, support and be an active bystander. Men and women can do that for anyone who is being demeaned. Let us redress the balance, encourage women to be a little more immodest and men a little less. Indeed I say, bring on the modest men. Those who respect people as people, for what they’ve done not merely the accident of their birth. I’m glad I know plenty of those. 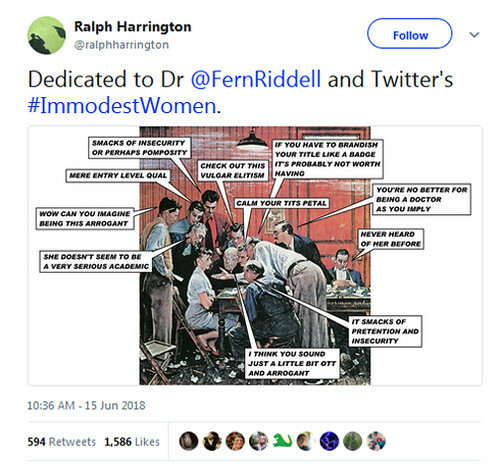 This entry was posted in Equality and tagged Amplification, Dr Fern Riddell, immodest women, mansplaining. Bookmark the permalink. 2 Responses to Where are the Modest Men? He was referring to Hoyle and Chandrasekhar’s flu viruses from space, but it is applicable far more widely. I remain hopeful that one day the compilers of the Oxford Dictionary of Quotations will appreciate its value and include it alongside his quotations on natural selection.